Officials have reported 25 confirmed cases so far. The outbreak occurred in an area described by one doctor as a 'hotspot' for outbreaks due to its extraordinarily high number of unvaccinated children. The parents of children in Washington, Oregon and 16 other states are allowed to apply for personal or philosophical exemptions from the vaccines required to get into public school. The World Health Organization calls the propensity not to get vaccinated "vaccine hesitancy," and the organization said one of its goals over the next 5 years is to decrease this hesitancy. Update Saturday, January 26, 2019: There are now 31 confirmed cases of measles in Clark County, Washington. Update Friday, February 1, 2019: There are now 42 confirmed cases of measles in Clark County, Washington. Update Thursday, February 7, 2019: There are now 50 confirmed cases of measles in Clark County, Washington. Update Monday, February 18, 2019: There are now 61 confirmed cases of measles in Clark County, Washington. Update Saturday, March 2, 2019: There are now 70 confirmed cases of measles in Clark County, Washington. A measles outbreak has spread across an anti-vaccination "hotspot" in Clark County, Wash., causing officials to declare a public health emergency. The outbreak has infected at least 25 people so far, including 18 children between the ages of 1 and 10, according to a government release last updated on January 24. At least one person has been hospitalized. Officials are prohibiting students and staff without documented immunity from entering schools identified as possible exposure sites. The outbreak occurred about 25 miles north of Portland, Oregon, in Clark County, an area known for its low rate of immunization. In an interview with the Washington Post, Peter J. Hotez, a professor of pediatrics and dean of the National School of Tropical Medicine at Baylor College of Medicine in Houston, described the county as a "hotspot" for outbreaks. "This is something I've predicted for a while now," he said about the outbreak. "It's really awful and really tragic and totally preventable." About 8 percent of children in Clark County were exempt from getting the vaccinations required to enter public school kindergarten in the 2017–2018 school year. The majority of those kids had received exemptions for personal or philosophical reasons. An increasing number of American public school students have been granted these so-called non-medical exemptions in recent years, which are currently allowed in 18 states. A 2018 study found that Portland had one of the highest numbers of kindergartens who had received such exemptions. "Portland is a total train wreck when it comes to vaccine rates," Hotez told the Post. 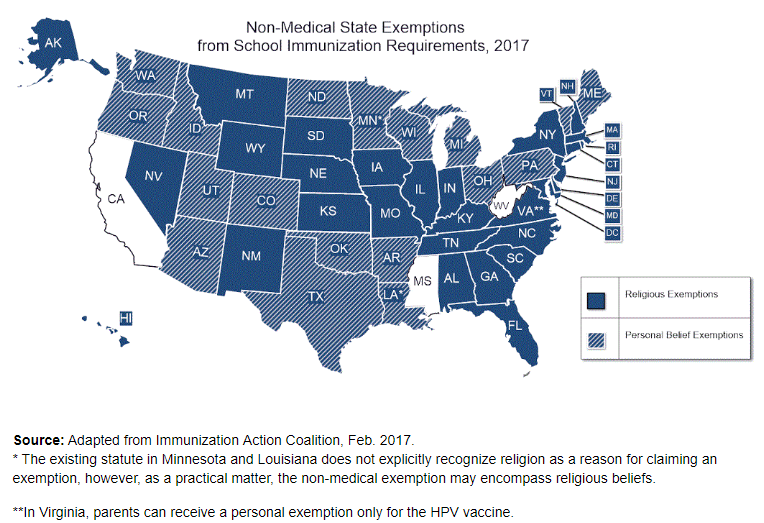 In parts of Oregon and Washington, these exemptions have almost surely helped to push local populations outside of what's known as herd immunity — the level of immunization that needs to occur in a population in order to prevent the spread of a contagious disease. A 2018 analysis conducted by The Oregonian estimated that some 65 percent of Oregon's public charter schools lack herd immunity, and that a much smaller yet still significant number of public schools lack herd immunity. Clark County officials wrote that "measles is extremely contagious. The virus travels through the air and can stay up to two hours in the air of a room where a person with measles has been… Measles is so contagious that if one person has it, 90 percent of the people close to that person who are not immune will also become infected." In 2019, the World Health Organization (WHO) began a 5-year "strategic plan" focused on a "triple billion target: ensuring 1 billion more people benefit from access to universal health coverage, 1 billion more people are protected from health emergencies, and 1 billion more people enjoy better health and well-being. Reaching this goal will require addressing the threats to health from a variety of angles." One part of that plan is eliminating vaccine hesitancy, which the WHO defines as "the reluctance or refusal to vaccinate despite the availability of vaccines." "[Vaccine hesitancy] threatens to reverse progress made in tackling vaccine-preventable diseases. Vaccination is one of the most cost-effective ways of avoiding disease — it currently prevents 2–3 million deaths a year, and a further 1.5 million could be avoided if global coverage of vaccinations improved."